I have Joya Fields back today and she’s sharing her latest release, Sidelined Afterlife. It’s the 3rd in her Hauntings at Inner Harbor series. Joya first stopped by with the 2nd in the series, Altered Frequency. She’s back today talking about the magic of Thunderstorms and Rain. Plus, she has a excerpt and giveaway too. Enjoy! Psychic medium Veronica Matthews hates being able to communicate with the dead and the nearly departed. What good is it if she can’t lead the police to the victims of violent crimes before they die? But when her neighbor comes to her for help, she’s torn—until she understands that the ghost haunting him is more dangerous than any she’s encountered…. Thanks very much for having me on your blog today, S.J. I’m thrilled to be here and to share my new release, Sidelined Afterlife. It’s the third novel in my Hauntings at InnerHarbor series where each book features a different couple dealing with their haunted apartment building. No worries if you haven’t read the first two books, it is a standalone, too. Because Sidelined Afterlife begins with a fierce-but-short thunderstorm, I thought I’d touch on the subject. Are you one of those people who love a good summer thunderstorm? I am! So are the characters in the book. A good storm usually begins with a darkening sky. Then, a warm breeze kicks up, rustling leaves and hinting at what’s to come. Next, there’s a rumble of thunder in the distance that sends everyone running for cover. A flash of lightning. Then, the sky opens up and the rain pours down. There’s something about the energy that fills the atmosphere, makes it almost magical to watch. Except if you’re caught out in it. But…if you’re like Veronica, the heroine of Sidelined Afterlife, maybe you like being out in the storm. For her, it washes her worries and stress away. Sure, her hair is flattened to her neck and her clothes are soaked. Instead of being bothered by it, though, she finds it liberating and cleansing. And how about that smell after the storm passes? So clean and fresh. Maybe the end of the storm even brings a rainbow. Mother Nature loves to remind us of her power and creativity, doesn’t she? That energy is exactly why I think thunderstorms fit so well into ghost stories. Power can go out during a storm, or maybe the air holds the charge of the nearby lightning. Something feels different. Maybe this lightning is exactly what makes a vortex open…or brings a different feeling to the atmosphere that’s welcoming to spirits. Maybe the reason I really enjoy thunderstorms goes back to childhood. On rainy or stormy summer days (with no air conditioning), my sisters and I would take over the huge covered porch with our toys. The limited space forced us to get creative and we found lots of ways to play old games with new twists while the rain poured beside us, creating a musical background of sorts. Thanks for stopping by today. I’d love to hear about your favorite thunderstorm memory. 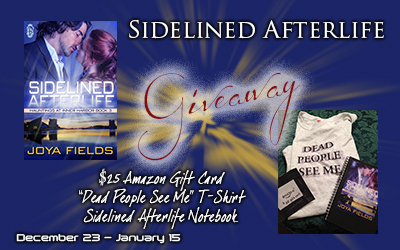 This entry was posted in Guest Posts and tagged Decadent Publishing, Giveaway, Joya Fields, Paranormal Romance, Sidelined Afterlife by S.J. Maylee. Bookmark the permalink.